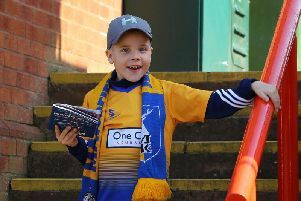 Danny Rose has reaffirmed his commitment to Mansfield Town and manager David Flitcroft after the striker’s request to be withdrawn from the transfer list was accepted by the club. The 24-year-old had submitted a request to be placed on the list amid speculation surrounding a potential transfer in early August. But after conceding to ‘poor advice’ upon reflection, the frontman has committed his future to the Stags. “I’ve had another really productive meeting with the gaffer,” said Rose. “I am fully committed to what the manager is focusing on achieving with the squad and despite not getting the results we’ve all wanted in recent weeks, we can all see the progress we’re making and the excellent style of football being produced. “That is a result of smart work on the training ground, innovative training methods and a real desire from the boys to succeed for the club. And added: “I have apologised to the gaffer, chairman, my team-mates and our fans for accepting some bad advice during the last transfer window and wish to make it clear that my sole focus is contributing towards this squad in our aim to win football matches on a consistent basis.